Amid an ongoing national debate about America’s southern border, the last two years have seen a growing controversy at the US-Canada border, as well. 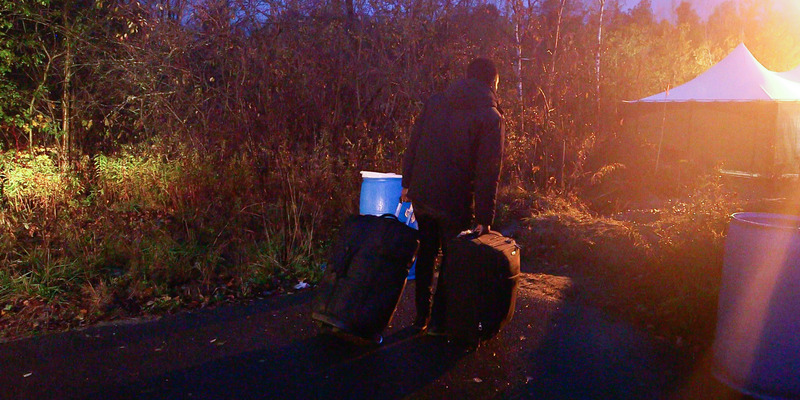 Migrants from around the world have been coming to a rural village in upstate New York for a chance to illegally cross the border into Canada, surrender themselves to arrest, and request asylum. Though most of them know what to do when they reach their destination, some are fearful of the Canadian authorities who arrest them, and hesitate in a powerful moment at the border. CHAMPLAIN, NY — The migrants who manage to reach the very end of Roxham Road have often made grueling journeys from countries thousands of miles away, fleeing poverty, violence, or danger back home, all to seek a new life in Canada. But sometimes, just feet from their destination, they pause. Sometimes it’s for minutes or hours — and sometimes they turn back altogether. On one cold, October evening, INSIDER observed a Nigerian asylum-seeker approach the border hesitantly, dragging his heavy, black luggage toward the ditch he wanted to cross. Floodlights from the Royal Canadian Mounted Police’s compound on the Canadian side of the border lit up the road, casting a long shadow behind him. The migrant froze, his shoulders quaking. „Gaba! Gaba! Gaba!“ shouted the taxi driver who had driven him up the road. The words meant, „Go! Go! Go!“ in the Nigerian language of Igbo. After several minutes passed, the migrant took a deep breath, and crossed into Canada. In the last two years, nearly 40,000 migrants have entered Canada illegally at locations like Roxham Road, many of them seeking safety they believe is out of reach in the US. Due to a legal pact known as the Safe Third Country Agreement, migrants aren’t officially supposed to request asylum in Canada if they’ve already traveled through the US — they’re told to claim asylum from the first „safe country“ they arrive in. The US is considered a safe country, at least by Canada’s definition, so migrants who come to Canada via the US are turned away at the ports of entry and told to seek asylum in America. But a well-known loophole allows migrants to request asylum if they reach Canadian soil without passing through a port of entry from the US. So the migrants have been crossing illegally, surrendering to arrest, and requesting asylum. Janet McFetridge, the deputy mayor of the town of Champlain, has made a habit of visiting Roxham Road each day, handing out hats, scarves, and other winter wear to the migrants she sees trying to cross. McFetridge says it’s common for migrants like the Nigerian asylum-seeker to pause before they cross. They’re not necessarily expecting to be arrested, she said, though it’s standard procedure for the Canadians. McFetridge said she’s seen some people turn around entirely, and walk back down Roxham Road.